Given a list of up to 32 elements, each consisting of 4 elements, and a second list with 4 elements, determine whether the move detailed in the second input is a valid chess move. The second input will consist of the same structures as the sublists of the first one, but rather than the x and y coordinates indicating where the piece is, they are indicating where it is trying to move to. For the above example, a valid move could be ["W", "B", 4, 3] (bishop moves one square forward and to the left), and an invalid move could be ["B", "R", 4, 1] as the rook would have to move through the knight, and the pawn to get to the square. As the move could refer to multiple pieces at times, you must test whether any of the specified pieces can make the move, not just one of them. For instance, the first example is valid for only one bishop, but it is still a valid move. However, neither black rook can perform the second move, so it is invalid. Any piece: No pieces can move onto an already occupied square, or off the board, unless that square is occupied by a piece from the other colour. For example, a white piece may move onto a square occupied by a black piece, but not a white piece. 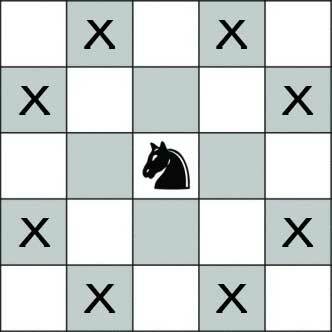 Additionally, no pieces, except for Knights, can move to squares which are directly obstructed by another piece. A move by piece B to square C is "directly obstructed" by piece A if A is directly, in a straight (orthogonal or diagonal) line, between B and C.
Exposing the king to check, by moving a piece on the same side as the endangered king. This only applies if a non-opposing piece makes the move, rather than an opposing piece moving to place the king into check. Leaving the king in check, in which case it has to move out of check. Therefore, if the king is in check and the move dictates that another piece moves, it is an invalid move, unless the other piece is preventing check. A piece can prevent check in one of two ways: either it takes the piece performing check, or it obstructs the path between the piece performing check and the king. A "check" is a situation in which the king's opponent could (if it was their turn to move) legally move a piece onto that king. This rule does not apply recursively, i.e. a king is in check even if the move by the opponent onto that king would leave their own king in check. If the pawn hasn't yet moved (you can determine this using the Y-coordinate; white pawns haven't moved if their Y-coordinate is 2, black pawns haven't moved if their Y-coordinate is 7), the pawn is allowed to move two squares forwards. If there is an opponent's piece diagonally in front of the pawn (i.e. on the square to the north-west or north-east of the pawn if it is white, or to the south-west or south-east if it is black), the pawn is allowed to move onto the occupied square in question. Bishops: Bishops can move between 1 and 8 squares along any continuous non-obstructed intercardinal (i.e. diagonal) path. A single square in any cardinal direction, followed by a 90/270° turn, followed by a final move of 2 squares forward. 2 squares in any cardinal direction, followed by a 90/270° turn, followed by a final move of a single square forward. Rooks: Rooks can move between 1 and 8 squares along any continuous non-obstructed cardinal path. Queens: Queens can move between 1 and 8 squares along any continuous cardinal or intercardinal (i.e. diagonal) non-obstructed path. Kings: Kings move like queens, except that they are limited to moving only one square per move (i.e. a king can only move to cardinally or diagonally adjacent squares). As a reminder, you cannot make a move that leaves your king in check; thus you cannot move your king into check, either. The rules of chess also contain special moves called "castling" and "en passant". However, because the legality of these moves depend on the history of the game, not just the current position (and because castling requires moving two pieces at once, which doesn't fit with the input format), you should consider neither of these moves to exist (i.e. 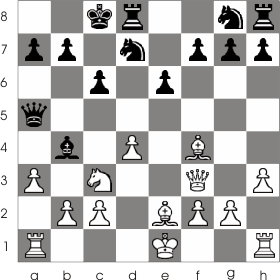 a move that would be castling or en passant should be considered illegal). You may output any two distinct results to indicate the validity of a move, and you may take input in a method you want. You may also choose 0-indexing rather than 1-indexing for the positions if you prefer. This is a code-golf, so shortest code wins! Without doing any of the really interesting code - but maybe this can compete with golfing languages or (dare I mention it) Mathematica? (Don't) Try it online! (because the python-chess package is not installed there and TIO does not allow internet connectivity so the pip-install code in the header wont work). (...and that in Python False and True equate to 0 and 1 respectively). Not the answer you're looking for? Browse other questions tagged code-golf decision-problem chess or ask your own question.